Tourism is Jamaica’s “bread and butter.” Right? At least as far as foreign exchange is concerned. It makes up roughly 30 per cent of our GDP, which is not to be sneezed at. Despite ongoing crime and violence (which would be a major turn-off for me, quite frankly, if I was a tourist) Jamaica is just about managing to hold its own. 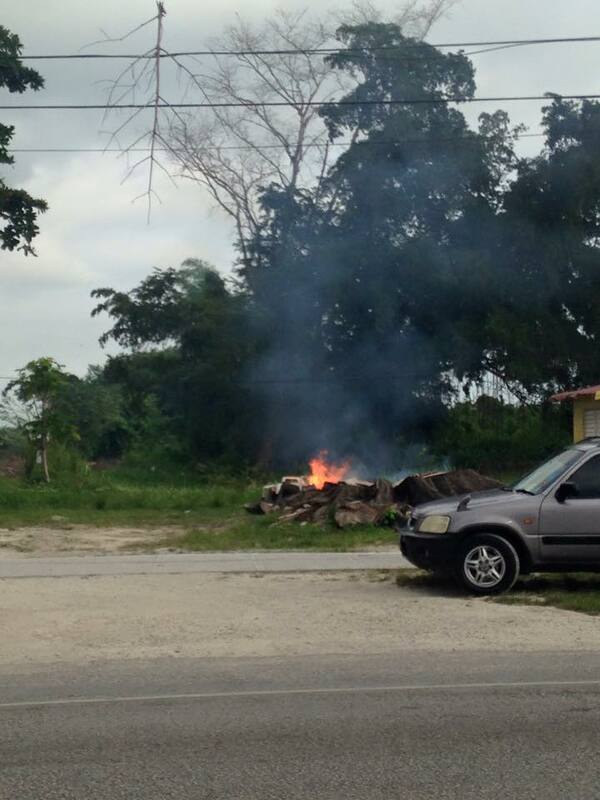 Nevertheless, while Jamaican tourism creeps along, some of our neighbors are storming ahead. Let’s quickly look at some figures. According to Caribbean Tourism Organization statistics (you can see them at onecaribbean.org), in the month of January several countries saw increases in tourist arrivals: Barbados (7.4%); Cayman Islands (9.5%); Cuba (16%); Curacao (13.9%); Dominican Republic (7.5%); Grenada (5.9%); St. Vincent and the Grenadines (9.8%). While Aruba and Trinidad & Tobago saw whopping increases of 21.7% and 19.6% respectively, that month Jamaica saw a timid 4.3% increase. So what’s happening here? What are we doing wrong? In terms of actual numbers we are still in third position after Dominican Republic and Cuba. The latter has no cruise ship passengers, and not many American visitors either. Yet. Puerto Rico and Aruba are not far behind us. Has our tourism strategy run out of ideas? Are we getting anywhere with the Bob Marley/reggae/Irie Mon/Jamaica No Problem image that we have carefully nurtured for decades now? Or is it wearing thin? My sense is that there is something missing. We embraced the “mass market” concept (and well-nigh invented it with the Sandals and Couples chains), and took it a huge step further with the “Spanish invasion” of vast all-inclusive hotels that spread rapidly along the north coast – hulking monsters between the road and the sea. I stayed at one of these hotels for a conference last year. It was a depressing experience, walking through (and getting lost in) endless high-ceilinged hallways and falling asleep to the lonely whirr of the air-conditioning. Was I actually in Jamaica? This vast edifice was built at the expense of a beautiful, rich wetlands area, public beaches, turtle nesting sites and a fishing area – all of which is no more. Anyway, we welcomed Spanish investment, with its artificial beaches (the tourists must have their sand), souvenirs made in China, and the promise of thousands of jobs for Jamaicans. With open arms. So what next? Shuffling around the self-service dining area with about 100 other people, tray in hand, I reflected that not only has our tourism industry been “dumbed down,” providing little stimulus or originality. The human touch is lacking, although one can usually find at least one pleasant waitress during one’s stay to chat with. 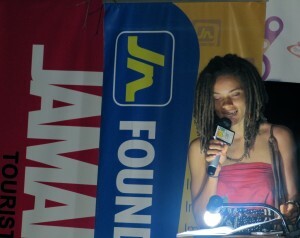 However, there are players in the tourism industry who are working hard to offer something different, uniquely Jamaican. 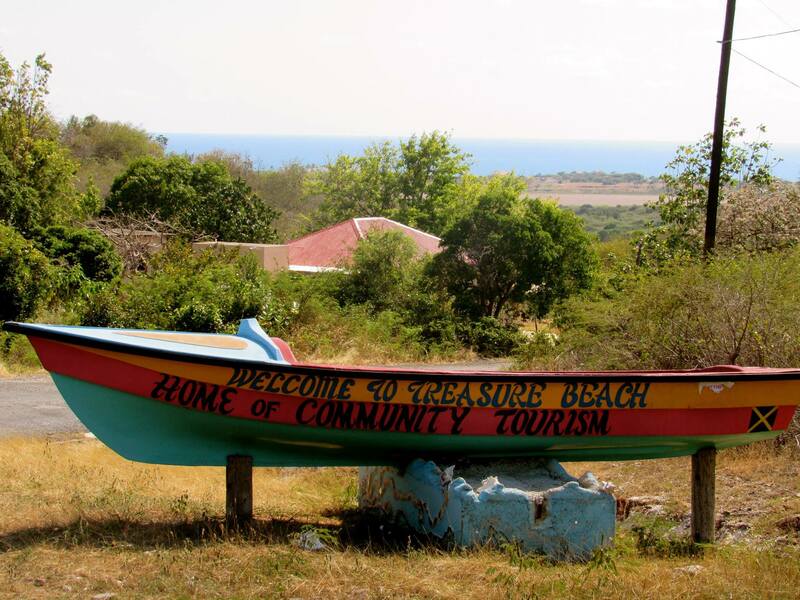 In Treasure Beach, Jason Henzell has brought a comfortable community feel to his brand of tourism, with quirky cottages on the sea and no towering walls to keep out the local people. In mid-island Jamaica, Diana McIntyre-Pike operates the Countrystyle Community Tourism Network, which offers a taste of “real” rural Jamaica – and its people. On the south coast, the Caribbean Coastal Area Management Foundation (C-CAM) is developing an interpretive wetlands center in Salt River, with preliminary plans to build a Heritage Village (for which C-CAM is seeking funding). The only glimmer of hope I see is that our Tourism Ministry does seem to be aware of the ongoing and steady destruction of our environment. Negril residents recently bemoaned the loss of a large and inconvenient cottonwood tree, which was hacked down and burned slowly over a matter of days – perhaps at the behest of a business man who didn’t want vendors sitting in its shade. Who knows why? Many of these destructive acts are random, senseless. The Ministry of Tourism’s Clean Coasts Initiative, partnering with the Jamaica Environment Trust and private sector players, is certainly a good move. The Sandals Foundation and others have played their part in seeking to redress the balance. I remember being told not to remove starfish from the sea at a Sandals resort. But is all of this enough? Is it large-scale enough? The Ministry is apparently trying to broaden the concept of cultural tourism by supporting events (like last year’s Drawing Room Project Writers’ Workshop in rural St. Mary) that help raise the profile of Jamaica’s tremendous creative industry. I am not just talking about reggae and dancehall, but also art and literature in its many forms. The Tourism Enhancement Fund seems to have the right approach. But is it too little, too late? So much has already been lost. What I would really like to see is an expansion of what I would like to call “humanity tourism.” This includes an increased focus on ecotourism, which brings in so much wealth in other parts of the Caribbean and Central America. The ecologically and culturally sensitive visitor from overseas has money to spend. These discerning travelers may not come in their thousands, like the masses to our all-inclusives; but their pockets are much deeper, and they are more likely to spend far more money in communities, directly benefiting (and interacting with) local people. 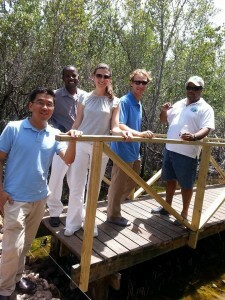 Later this month, the Caribbean Birding Trail, a project of BirdsCaribbean, will train Jamaicans as bird-watching guides in Stewart Town (an area threatened by bauxite mining), where a beautiful birding trail has been developed. Jamaica has 28 endemic species of birds that are found nowhere else in the world! As the 20th International Meeting of BirdsCaribbean takes place in Kingston (from July 25-29), we should note that according to the United States Fish & Wildlife Service the annual economic value generated by birders and other wildlife watchers is around US$ 32 billion per year in the United States alone. This is equal to the GDP of our neighbors in Costa Rica – which is a major ecotourism destination, of course. And the funding support is out there for sustainable tourism projects. So, here’s to more humanity, more empathy in tourism. Fewer giant cold hotels (literally and figuratively “cold”), and more warm and friendly experiences for our visitors. Who knows, we might even rescue what’s left of our beautiful environment, in the process. We are only a small island, after all. And concrete looks the same the world over, doesn’t it? “A birding center and eco-friendly cottages in Cockpit Country?” This would be an instant tourism success, and the perfect location for it would be Stewart Town, Trelawny. As one of Jamaica’s most important birding ‘hotspots’ this area should be protected and managed for sustainable nature tourism balanced with farming. No bauxite mining and no limestone quarrying! Your discussion points to some of the complications of framing tourism correctly. Focusing on growth in visitors means talking about volumes, or mass tourism. So, if that’s important to the discussion, then implicitly so is mass tourism. That doesn’t argue against smaller scale tourism, but accepts those large numbers are important. But, large numbers of visitors matter less than how much they spend, and most countries have no good idea, often working with smudgy estimates. Add to that, how much money stays in the country: in Jamaica, the prevailing view is that there’s a net foreign exchange outflow from tourism. Sure, building and servicing the major hotels provides local jobs and income, but the country hasn’t gained overall. We know also that local enterprises are not well connected to tourism, which remains an enclave sector. I’ve not seen figures on how Eco-tourism wealth creation. We can argue that it’s better to have so called ‘humane’ tourism, but what do most visitors seek when leaving their homes and spending their savings on tourism as leisure? The ‘real’ Jamaica is no real draw when you can experience your own national ‘reality’. If you lie in NYC, why not just go into the Adirondacks or Applachia? How much foreign quirkiness do visitors want to buy? People may buy that in some laces, but it’s usually when the general environment in which it exists is deemed ‘safe’. Then, our blighted image for crime can come back and bite. Many tourists are not at ease with locals, except at a certain ‘distance’, literal or metaphorical; less so if they feel they may pose real and significant threats. One can’t unravel the current model of Jamaican tourism, but I agree that the other options have merit. How attractive will they really be? I’m not sure they can beat out their real competitors, which are both Jamaica’s big hotels with creature comforts, as well as attractions in home countries that may be better sold, remembering that those options usually entail less aggravation and cultural compromises. A perfect analysis of Jamaican tourism today that shows the reasons for the decline and offers good advice for its rescue. Well written. Well said!!! Thanks for your comment, Wendy! Yes – I agree. I think that’s a “no-brainer” for Cockpit Country! The center could include talks by naturalists (visiting or local) on a regular basis, that would also involve the local people and their wealth of experience. Organic farming could be an added feature. Thanks so much, Barbara! We have a wealth of natural riches at our fingertips that we just need to tap into. “Rescue” is a good word – our beautiful environment could rescue us and the tourism industry, if we give it half a chance! One concern I always have with ‘Eco tourism’ is if and how one manages to exploit environmental riches but not endanger it in the process. I don’t have simple answers, but just think about how easy it is to degrade what was attractive for being less used. Big daily discourse for us everyday Emma, thanks for raising keeping the issues alive. We embrace community and responsible tourism, and really do not think we need to create any more terms to speak to just an awareness of human behaviour for those of us who host and also for those visiting. Tourism is about having an awareness of interactions with humanity and flora and fauna and the environment in general and being responsible is very important in that mix. The JTB have had to support the Rastavillage because of a clear rising demand to see and experience our culture. This demand has not come from the country marketing culture/art or the creative industries, but from the market seeking new and different experiences. Jamaica still has a very wide variety of wonderful activities in which to become engaged, both for local tourists and overseas visitors, marketing or lack thereof is a major issue. Marketing carries a need for understanding the technology for having the networks and getting the message out. Many small offerings are very challenged in this way – just enough capacity, people, equipment, knowledge and most of all strategy. I can go on for hours on this topic because we live it everyday. The conversation has to happen at every opportunity, because most of all, if we do not heighten our awareness and transform awareness to action in order to prevent the ongoing self-destruction of ourselves (senseless, violence) and our environment (mounting garbage- specifically plastic and polystyrene) we might as well forget inviting anyone over to engage them in any kind of activity at all. I agree with pretty much everything the writer says. I would certainly support both eco-tourism and Humanity Tourism. As an online follower – another example of community and local tourism is the Ahh … Ras Natango gallery and garden outside Mobay. Look them up on Facebook, they are a template to follow, not least the charm, friendship and dedication to the task they set themselves, of the family managers, but also to the community they support around themselves. In a sense you have said it very well. Yes humanity tourism, eco tourism, community tourism, bed & breakfast, family tourism stay with a family, heritage & history tourism, cultural/entertainment tourism, natural organic & food tourism, ganja tourism, health & wellness, all can be added to the existing base, mass tourism, monster hotels which wrecked Spain already and sought refuge here. Important oversights where does the money from tourism go? The return from the industry is not good enough to stimulate expansion, reinvestment and open up the untapped resources and new attractions. New investors have come each time let us say when the JA$ is worth nothing and the contracts, tax freedom and incentives to invest are all there. On top of all this,if 60-70% goes out for imports to keep going and money is kept in foreign banks and “madison ave types” earn big money to sell JA then what is the financial outcome? Gross figures are different from net. We owe more money now than before the IMF came, who is fooling whom? Concrete tourism has wrecked the beauty of the country, Negril, MoBay, Ocho Rios, the reefs, the water supply, sewage. I was at a RIU hotel and for the whole week there was a convoy of cesspool trucks on a 24/7 basis to take out the sludge as the hotel was overcrowded. You can’t drink the water,but bottled water was there. The country is very dirty, with dirty drains and gullies and people. In Cuba they wash the streets and prune the trees every day. Thirdly we are a racist, classist and crass money society and even though we have excellent hotel workers who the guests love, ordinary black people are excluded if not punished in this industry. So there is an underbelly of dis-satisfaction, hostility and an overabundance of hustlers & tourist harassment rather than an organised, all-inclusive industry with people enjoying, earning and protecting the industry. 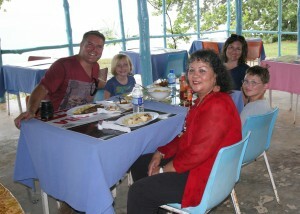 In Mexico locals are served first, visitors second as a matter of policy. In Barbados the beaches are open no wire fences and dogs. In JA craft vendors are treated like dogs, the indian duty free merchants pay extortion or bribe money for tourists to be taken to their shops, cruise ship passengers pay 30% extortion rates to ship agents for tickets to attractions. We really have no or minimal black tourists who are the new spenders because we want to keep JA white. Big mistake and a few big companies are taking over everything from buses, taxis, vending, craft, etc. JA has 6 possible world heritage sites at JNHT. Spanish Town is a war zone, and they want to mine bauxite and gold in the Cockpit & Blue & John Crow areas so you see the challenges for a new type of tourism to develop & flourish. We still need a revolution in thought word and deed to do what you want and what is needed that’s why I participated. Dear Mr. Crawford: Thank you so much for your interesting commentary. I know, I am very idealistic perhaps – but just looking from the outside (and I have visited a number of the large resorts in the last few years) I am always disturbed by how “impersonal” and almost non-Jamaican our product is. Or at least, it is very superficial. It’s a good question: Where does the money from tourism go, and how much of it stays in Jamaica? And of course, that relates also to who “controls” the industry. Perhaps that is a whole different topic – an article twice as long! I agree with you on that underbelly of resentment, too, in the context of our divided society – it is so very obvious. I have visited Barbados and St. Lucia, where I noticed locals and tourists using the beach at the same time with no noticeable harassment. Thanks for reminding me about DiCaprio’s eco-resort in Belize, on a scruffy little island, not as beautiful as our Goat Islands! I should have mentioned that. Dear John: Thank you so much for your comment. Yes, I have not visited Ahh…Ras Natango yet but know them on Facebook – that is exactly the kind of model I am thinking of. It is that personal touch that I was trying to express is so very important! Jamaica does have a reputation for warm, hospitable people and it is not for nothing… And this kind of tourism “product” (hate that word) that also directly benefits the surrounding community. Thanks for your input! Dear Arlene: I could not agree with you more – tourism IS about people and our humanity. I like the way you use the word “responsible,” too. Our culture, our natural heritage and our people are all wrapped up in a package, and it’s a very beautiful one. My experience in that all-inclusive hotel was so depressing…like another planet! It’s interesting to note that the JTB’s support for the Rasta Indigenous Village in Montego Bay came as a result of market demand and interest in the Rastafarian culture – which to me would be a “no-brainer”! (And I am definitely going to visit you soon!) I can imagine the tremendous challenge of marketing, however, despite the benefit of free social media “getting the word out”… I guess as I said, I am looking at this issue from a rather idealistic point of view. This is the ideal – we have to work towards it. Let us throw our support behind Jamaica and its people. The foreign mega-hotels can look after themselves. All the best and thank you so much for your heartfelt comments. I know – it is difficult. Ecotourism can sometimes, paradoxically, harm the environment. Best practices need to be followed, lessons learned and the “product” carefully designed so the tourists “leave no footprint,” or very little… Sigh. The real opportunity is in more deeply embracing “religious tourism.” The Bahamas has a model that encourages (and partially funds) missionary teams. This opportunity alone could provide an enormous bump to Jamaica’s stagnant tourism. Now, that’s an idea, too. One that would benefit the religious organizations and Jamaican communities quite directly. I have never heard anyone mention this possibility. Thank you for this, Christopher. An interesting article! I agreed with most of what has been said but what is lacking in Jamaica including the Tourism Sector is good leadership and vision. No matter how many tourists went to Jamaica if the country and the local people do not benefit from the visits of tourists the industry is pointless. Building large hotels is not the solution in developing a thriving Tourism industry because i) for years tourists are saying they dont want to stay in big and impersonal hotels they want to experience the Jamaican people and its culture ii) the money generated by these hotels do not stay in Jamaica it goes back to the country of origin iii) the peanut wages they pay staff is not enough for people to look after their families. 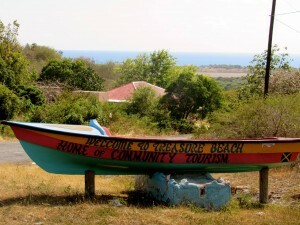 So how much does Jamaica(including the local people) really benefit from Tourism? This is what need to be looked at. Thank you! Dear Hyacinth: Thank you so much for your great comments. I had exactly the same conversation on tourism with my stepson who was visiting this week, as we passed by those huge Spanish hotels on the north coast. I also pointed out to him that much of the money goes overseas… As I did suggest in my article, it IS indeed the vision that is askew. There is a vision for tourism, but I am not sure it is the “right” one for Jamaica… Leadership is an issue right across the board in Jamaica, isn’t it?